Blowout Sale! 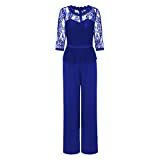 Up to 58% off on Jumpsuits, Rompers & Overalls at SCRHI. Top brands include ECOWISH, Viris Zamara, Veroge, AVINE, KOH KOH, Imily Bela, ABASSKY, Dreamparis, FAFOFA, Adelyn and Vivian, Acelyn, LUKYCILD, & Sumtory. Hurry! Limited time offers. Offers valid only while supplies last.